The Sony Xperia XZ3 failed to impress the reviewers at DxO Mark and, strangely, it failed to best the score of the Xperia XZ Premium. Note: not the XZ2 Premium, but the first Premium phone from early 2017. In fact, the phone just barely beat the mid-range Xperia XA2 Ultra. Here�s what went wrong. The XZ3 was praised for nailing the exposure and producing images with good texture and pleasant color. The photos can be rich in detail if shot in well-lit areas, but the camera doesn�t like the dark. Autofocus gets slower in the dark � taking up to half a second! - saturation gets boosted too high, the level of detail falls and the white balance becomes less accurate. But the Xperia XZ3 camera has issues during the day too. Its dynamic range is not as wide as competing flagships and the corners have issues � corner softness as well as increased noise. The lack of built-in bokeh mode also hurt the phone. Artifacts like ringing and other flaws mean the still camera gets a score of 76. It rates higher in video recording, scoring 85. The capable electronic image stabilization scored a few points and the image quality was good, showing fewer artifacts than stills. The dynamic range still isn�t great and the sluggish autofocus isn�t great at tracking in low light. The overall score for the Sony Xperia XZ3 is 79. 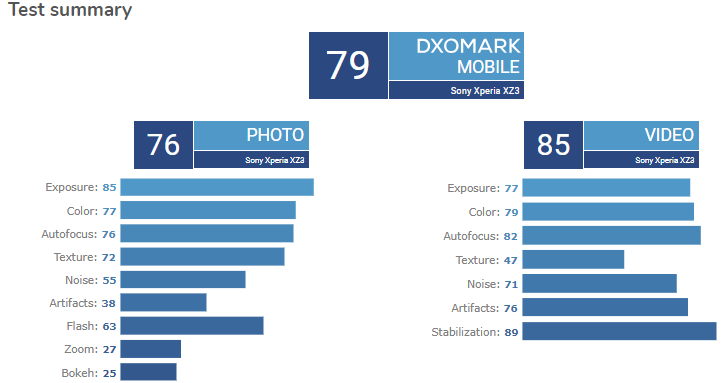 For comparison, the XZ Premium scored 83, the XA2 Ultra got 75. Read the full DxOMark review here.